changes ⋆ 100% Private Proxies - Fast, Anonymous, Quality, Unlimited USA Private Proxy! So, since this is the amdgpu driver, Mesa3D and KMS are in use. I have a 4K monitor connected to the RX 580’s DisplayPort. Sometimes, when I started Kubuntu the display off, and later turn it back on, the image isn’t the usual 3840×2160 pixels. Instead, sometimes it is 1920×1200, or 640×480 (and shrunken in the vertical direction). In the latter case, I have to turn the monitor off and on again until the resolution is 1920×1200. Then I can go to the display settings and set it back to 3840×2160. This is very annoying, and I found no indication of any problems anywhere. Does anybody have any idea what is going on? I have a processor class AbstractProcessor and multiple concrete classes of the same which gets called in order of the business logic. The logic in my concrete classes keeps on changing depending on the business requirement. This leads to change in the corresponding test classes and seems to be a tightly coupled approach. Is there a better way to design such classes. For training purposes, I need some pointers on the tools and tips to implement an active Man-In-The-Middle attack. I looked in the web. There is ARPP spoofing, which seems will allow me to sniff on users requests but no manipulate. What is the easiest way to manipulate the user’s requested address through a MITM attacker who does not have access to the user’s device, but only the communication channel? As I said, this question is for learning. It is also worth nothing that this is detectable by modern client agents or browsers, and I do not intend to implement it in any ways other than lab learning environment. I have two fields on a form. Category and Sub Category. 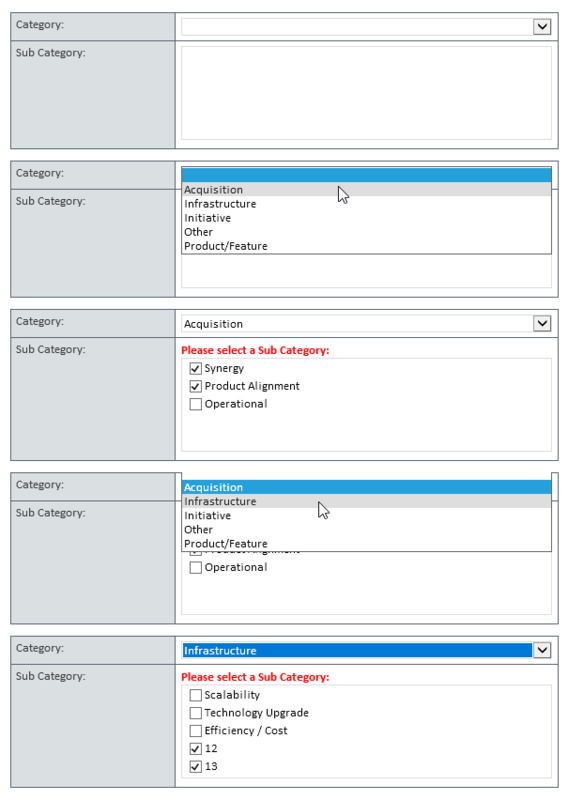 Category is a drop-down list box and Sub Category is a multiple-selection list box that is filtered by the Category drop-down. Everything is working (mostly). The problem I’m having is that if I make a Category selection then make a couple of Sub Category choices and then change my mind to a different Category, the previous Sub Category selections are still shown in the list by their lookup IDs. It’s easier to show than explain. I was thinking I could somehow put a rule on the Category field so that it resets or clears the Sub Category field whenever the Category field is changed. I know I can set a field’s value but I can’t figure out how to clear the Sub Category multiple-selection choices. Thank you for your help! Today my gf wanted to flight home (Berlin Tegel -> Minsk). She had booked a flight long ago with airbaltic and checked in 1h before depature. When boarding should habe started, there was a plane change all of a sudden. People panicked and where rushing the counters to know what was going on. In the end, the boarding was done by calling the names on the fligth list one by one. At this point my gf asked one of the service workers there to help her out. She just replied that she needs to wait. So thats what she did. After all names were called, 5 people were still there. The same service worker insisted that she called all names and therefore these 5 people were obviously late. This obviously was not true. My gf is crushed. What can we do? The ticket was scanned at the security control but I am afraid thats the only proove we have that she was there in time. I have to design visual representations for each of these states. The state of an object in it’s initial state (MOdelled) has already been defined earlier.